Basilika: the workes of King Charles the Martyr: with a collection of declarations, treaties and other papers concerning the differences betwixt His said Majesty and his two Houses of Parliament. 2 vols. 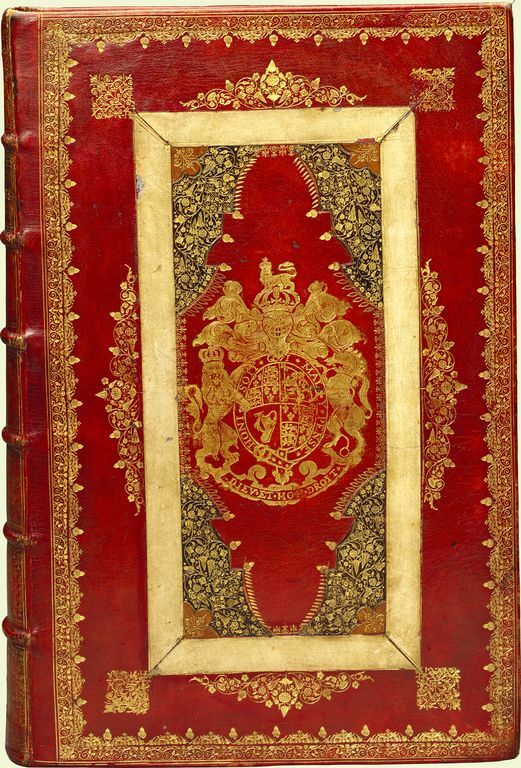 Contemporary binding of red goatskin by the Royal Heads Binder for Charles II with his arms on front and back covers, the covers elaborately tooled in gilt, borders with double roll-tool border with acorn tools and with volute corner tools, the central panels within inlaid white goatskin borders and onlaid with brown and black goatskin, the central panels with flower volutes and acorn tools, the centre of each side panel tooled with strawberry and flower volutes and tools, scrolls, flowers, acorns and dots; the spine divided into seven panels, tooled and lettered in gilt; all edges gilt.